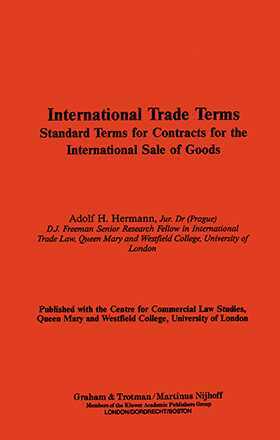 International Trade Terms (Intraterms), the first publication of its kind, is a set of standard terms for the sale of goods, accompanied by comments relating them to national laws of the main trading countries and to the Vienna Convention. The accompanying computer disk enables easy incorporation of the terms and main notes into contracts or communications with business partners. Intraterms deal with contracts in general, international sale of goods, transportation of goods sold, abbreviated terms and the resolution of disputes. Drafted in plain language, Intraterms avoid legal jargon and ambiguities, and meet as closely as possible the requirements of the main trading countries. They will help traders and their legal advisers to overcome the uncertainties of the English law and other national laws and to avoid the pitfalls presented by the interaction of national laws and of international conventions. They also provide a rich material for the comparative study of commercial law. Introduction. One: General Provisions. §101. Short Title. §102. Application Clause. §103. Aims and Rules of Construction. §104. Scope and Relation of Municipal and International Law and Usage. §105. Interpretation of the Contract. §106. Good Faith and Illegality. §107. Communications. §108. Specification and Cooperation. §109. Fundamental Breach. §110. Frustration. §111. Force Majeure. §112. Consequences of Frustration and Force Majeure. §113. Modification or Termination of Contract by Agreement. §114. Waiver. §115. Justified Withholding of Performance. Two: Contract for the Sale of Goods. §201. Definitions. §202. Quantity and Price. §203. Obligations of the Seller. §204. Obligations of the Buyer. §205. Transfer of Ownership and Reservation of Title. §206. Interest on overdue Payments. §207. Passage of Risk from the Seller to the Buyer. §208. Conformity of Goods to Contract. §209. Examination, Inspection and Rejection of Goods. §210. Rights of Third Persons. §211. Sellers Remedies. §212. Buyers Remedies. §213. Damages. §214. Additional Time. §215. Anticipation of Breach. §216. Voiding of the Contract. §217. Substitute Transaction. §218. Specific Performance. §219. Replacement, Repair, Reduction of Price of Non-Conformed Goods. §220. Additional Time and Cure of Defects. §221. Product Liability. Three: Transportation of Sold Goods. §302. Application. §303. Division of Risks, Costs and Duties. §304. Checking and Packing. §305. Time and Place of Delivery. §306. Routing. Notification. §307. Documents. §308. Cooperation. §309. Insurance. §310. Export Authorisation. §311. Import Authorisation. §312. Pre-Shipment Inspection of Goods. §313. Resale of Floating Goods. Four: Abbreviated Contract Terms. §401. Scope of Abbreviated Terms. §402. Terms Implied in Definitions. §403. Terms Suitable for Multimodal Transport. §404. Terminology of Multimodal Transport. §405. EXW - Ex-Works (or ex Plantation, Mill, Warehouse, etc.) §406. FCA - Free Carrier (named place) §407. FSA - Free Station of Arrival (named station of destination) §408. CPT - Carriage paid to (named destination) §409. CIP - Carriage and Insurance paid to (named place of destination) §410. DAF - Delivered at Frontier (named place) §411. DDU - Delivered duty unpaid (named place of destination) §412. DDP - Delivered duty paid (named place of destination) §413. Terms Suitable for Sea and Inland Waterways. §414. Free Alongside Ship (named port of shipment) §415. FOB - Free on Board (named port of shipment) §416. Free on Board (named place of destination) §417. CFR - Cost and Freight (named port of destination) §418. CIF - Cost, Insurance and Freight (named port of destination) §419. DES - Delivered ex-Ship (named port of destination) §420. DEQ - Delivered ex-Quay (duty paid) (named port of destination) Five: Resolution of Disputes. §501. Negotiations. §502. Disputes Arising while the Performance of the Contract is in Progress. §503. Other Disputes. §504 Conciliation. §505. Mini-Trial. §506. Arbitration.